This is my fourth Studio Ghibli film (I first saw Spirited Away years ago and then both My Neighbor Totoro & Ponyo more recently). I’ve never really quite been able to get into them (although I do love the character of Totoro – would like to re-watch that with subtitles as I saw it dubbed when it was on TV and I really hate dubbing). Maybe Spirited Away wasn’t a good introduction to Studio Ghibli for me as it was pretty “out there” – I should have started with Totoro or Princess Mononoke. 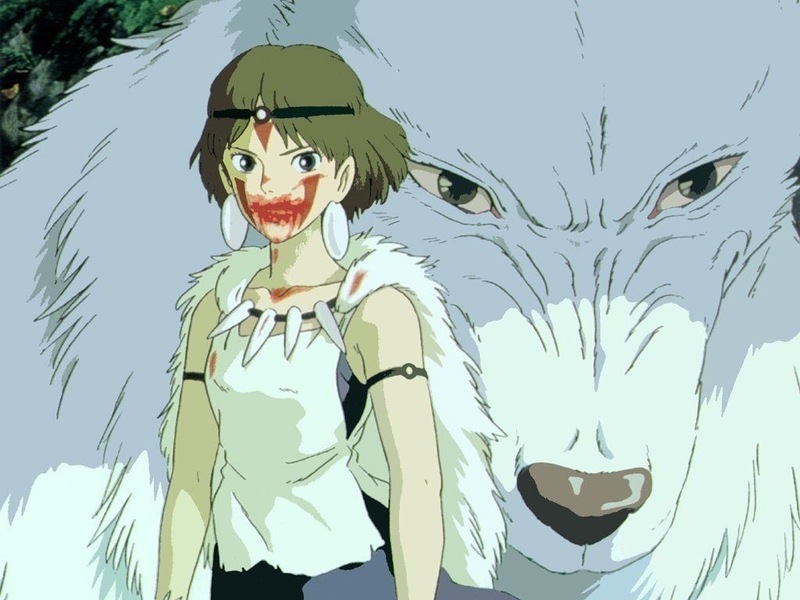 I really enjoyed Princess Mononoke and would have to say it’s my favorite I’ve seen so far (I’ll see if Totoro ends up my favorite after watching it with subtitles). It’s made me much more eager now to see the rest of the Studio Ghibli films in the top 250. To be honest, it’s probably because I found the story much more straight-forward for my simple, Western, Disney-loving ways. 😉 It had very strong main characters, a groovy Deer God, and, most importantly, Kodama! I LOVED these dudes. 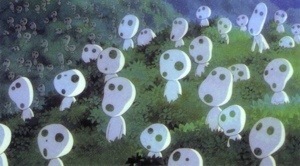 I do think they’re what helped make me enjoy Princess Mononoke so much. 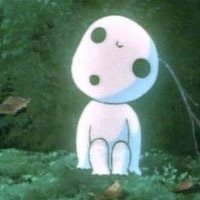 A kodama (木魂?) is a spirit from Japanese folklore, which is believed to live in certain trees (similar to the Dryad of Greek mythology). Cutting down a tree which houses a kodama is thought to bring misfortune, and such trees are often marked with shimenawa rope. 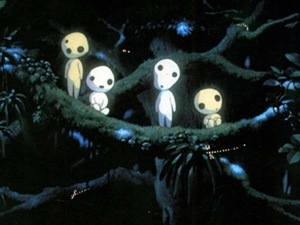 In Princess Mononoke they have these adorable little bobble-heads that rotate. They’re awesome and I want a few of them to follow me around every day & keep me company. Watching Princess Mononoke was an enjoyable experience and I’m now looking forward to exploring other Studio Ghibli films and re-visiting the ones I’ve already seen. And out of the 9 films I’ve watched so far for my IMDB top 250 project, this is my second favorite one (Modern Times being first – it will be interesting to see if anything beats that one for me as I absolutely loved it). Yeah – I wish I hadn’t seen the dubbed version of Totoro as I think movies really lose something when dubbed. Not sure which one I should watch next. I think the only other one I have is Castle in the Sky but as that’s recorded off TV, it’s probably dubbed so will have to check. I actually think a lot of effort goes into the Ghibli dubbed versions.A lot of times the subtitles don’t match whats being said in Japanese any more than the dub. I remember reading somewhere that Miyazaki said to watch the dubbed versions, so you won’t be distracted by the text and miss out on the action! Did you notice how the deer god scene is completely ripped off in Snow White and the Huntsman? Really? That’s interesting about the dubbed versions – I find it distracting, I think, because they use American actors who are fairly well known so I can’t help but picture those actors and it kind of takes away from the foreign magic of the films. 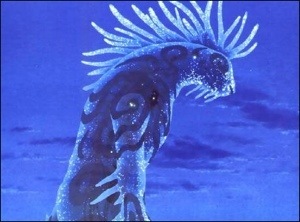 Miyazaki truly is one of the greats when it comes to animation and Mononoke is one of the prime reasons why. Good write-up. As a fan of Princess Mononoke, I think you’d like Oblivion Island! 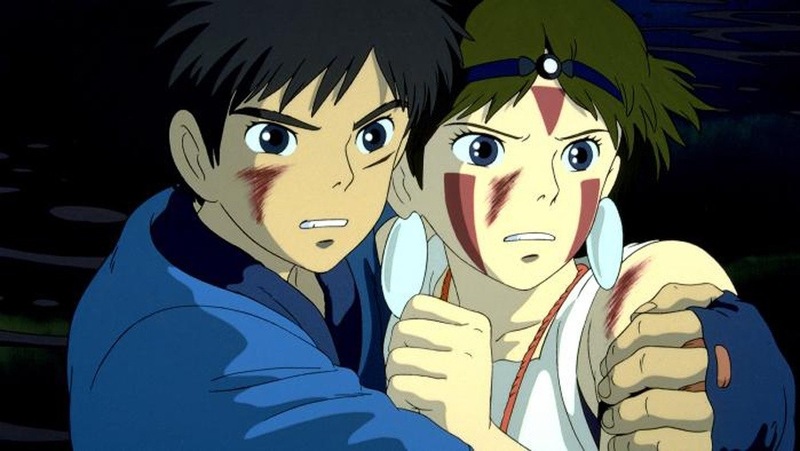 Here’s the very first Studio Ghibli review I did in the very early, happy days of my blog – Princess Mononoke. It’s now ranked at 73 in the IMDB Top 250. A huge THANK YOU for the great response I’ve had to my little Studio Ghibli Project so far – I wasn’t expecting that! 🙂 I’m afraid I won’t be online for the next week or so but I’ll have some things posting – it’ll just take me a while to reply to any comments… Thank you again to anyone who takes the time to comment – I really do appreciate it! used this movie as a visual inspiration for my PUNCH stories on my blog! It’s actually far less weird than Howl’s Moving Castle or Spirited Away. But I’d recommend Castle In The Sky next. 🙂 I’m going to double check that one soon but it was pretty kid friendly from what I remember. Hehe. Awww – they’re sweet! You might change your mind if you saw the movie. 😉 They’re not evil – they just protect the forest or whatever (this is a bit like a Japanese Fern Gully with added weirdness). 😉 I seriously want some Kodama to go along with a Baymax & a Groot! …I’m just imagining the lot of you trooping down the street. It’s the weirdest mental image, but it’s cracking me up. Hahaha.